- With a Two/more working Glove Ports. - A Cylindrical Antechamber (ø 385mm, length 600mm) & a Mini-antechamber. - LED light removable front window panel. - Gloves made of Butyl. - Stainless Steel adjustable shelf and stainless steel circulating piping. - 1 set of glove box frame with roller for stand. 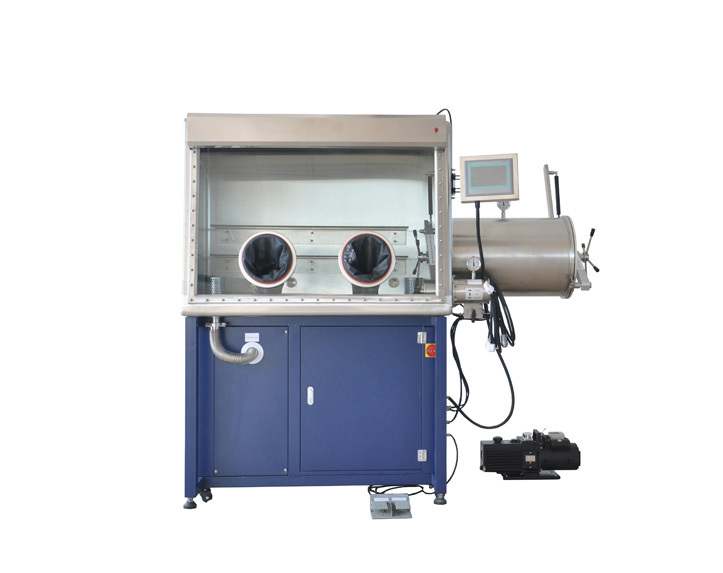 - Integrated high vacuum feedthroughs. - 0.3 μm gas inlet and outlet HEPA filter. - Controller with a Color Touch Screen SIEMENS Display. - A Closed Loop Gas Re-circulation System. - Regenerable H2O/O2 Purifier Unit. - Attainable purity < 1 ppm H2O, < 1 ppm O2.